Grab life by the moments and embark on a new adventure in Monterey County! Whether you think you&apos;ve done it all, or are a first-timer to the area, we challenge you to embark on an exploration outside of your comfort zone. Each invigorating itinerary is based on a 2 to 3-day getaway, which one will you choose? Monterey County is a premier destination for those looking for an adrenaline rush. Biking, hiking, hang gliding and skydiving are just a few of the outdoor activities that push visitors out of their comfort zones while in Monterey. Your adventure begins in the heart of Monterey at the Monterey Plaza Hotel & Spa conveniently located on historic Cannery Row. The incredible ocean views at this luxurious property make you feel as though you are on the edge of the Monterey Bay. Capture this moment because you are about to see this view from a totally different perspective. Just north of Monterey is the Marina Municipal Airport where your limits are sure to be tested at Monterey Bay Skydive. Here you will be strapped in for a tandem jump for a once-in-a-lifetime experience with unparalleled views of the Monterey Bay, Salinas Valley and Santa Cruz. Any hesitations you have will be dimensioned once you get a glance of what&apos;s awaiting you. After you let your stomach settle a bit, head over to Salt Wood Kitchen & Oysterette near Marina State Beach. Dine on locally-driven fare before taking a stroll along the beach to watch surfers, kit flyers and hang gliders. Want to see what the edge of the earth really looks like? This morning head south on Highway One to the Point Sur Lighthouse in Big Sur. Here you will get a private tour of the iconic landmark that sits on a volcanic rock 361 feet above the Pacific Ocean. Just down the highway is Big Sur village and the Big Sur Roadhouse. Their fresh take on California cuisine is divine! Take your time getting back to Monterey and enjoy the sights along Highway One. The particular stretch between Big Sur and Monterey often lands on lists for "best road trips." Once you&apos;re back in Monterey mosey on over to Rosine&apos;s for dinner. Be sure to save from for dessert, their cakes are almost too pretty to eat! Last but not least, your challenge also "dares" you to check out Monterey County&apos;s Parks including Jacks Peak, Toro Park, Royal Oaks, Lake San Antonio, San Lorenzo Park and Laguna Seca Recreation Area. With a diverse range of acclaimed restaurants, a bounty of regional produce and seafood, large scaled food and wine events and 40,000 acres dedicated to vineyards, it is no wonder why Monterey County is a hub for foodies and wine aficionados. Your epicurean adventure begins in an area where a new wine tasting room seems to open daily. Carmel-by-the-Sea boasts well over ten tasting rooms within a mile radius and luckily your hotel is within walking distance to them all. The historic La Playa Carmel is just steps from the white sands of Carmel Beach and the boutique shops along Ocean Avenue. Just a few miles from your seaside escape is Carmel Valley which harvests mainly Cabernet Sauvignon and Merlot varietals. From Monterey and Carmel you can either drive or hop on MST&apos;s convenient Grapevine Express. Today you will visit Holman Ranch Vineyards nestled in the Santa Lucia Mountains for a vineyard tour and tasting. Not only do they pour a full-bodied Pinot Noir but their home-grown Tuscan olive oil is to die for! After finishing your full glass jaunt down to Carmel Valley village and fuel up on fresh and casual cuisine at Lucia Restaurant. Continue down Carmel Valley Road to the hydrothermal retreat known as the Refuge. Here you will truly un-wine&apos;d with massages and access to one of the only spa facilities of its kind for the ultimate in thermal cycles. You are sure to get a good night sleep after completing sessions of the hot and cold plunges. This morning you will venture to another major grape-growing region, the Salinas Valley. River Road in particular is lined with several artisan wine tasting rooms including Wrath Wines. Sip on some of their award-winning Chardonnays before exploring Hahn Estates, just across the street. Here you will explore their vineyards by ATV and soak in incredible views of Steinbeck country from the top of the estate. This evening you will have dinner at authentic Italian eatery Cantinetta Luca, just a few blocks from your hotel. Feel free to take a gander at their expansive wine list before catching a show at the Pacific Repertory Theatre, also located in downtown Carmel. If you&apos;re glass isn&apos;t yet half full make a stop at Peter B&apos;s Brewpub before your adventure is complete. It&apos;s the perfect place to grab some comfort food and a locally-brewed beer or two. Cheers! Although Monterey County is a place for relaxation there is an element of speed for those who are looking for it. Begin your 0 to 60 challenge at an unassuming B&B located along the scenic stretch of Ocean View Boulevard in Pacific Grove. Martine Inn is full of unique antiques dating back to the 1800s and houses an array of authentic vintage MG cars and automobilia. Check the event schedule at legendary WeatherTech Raceway Laguna Seca where you might be lucky enough to watch one their epic races like the Superbike World Championship or Rolex Motorsports Reunion. Before your adrenaline rush wears off speed over to Turn 12 Bar & Grill in downtown Monterey. The racing-themed eatery&apos;s unique name stems from the 11 turns at WeatherTech Raceway Laguna Seca. Pay close attention to their 50-foot pewter bar top which is even detailed with tire tread marks! 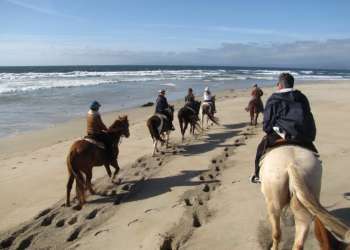 Rise and shine for a gallop on Salinas River State Beach in Moss Landing with horses and guides from the Monterey Bay Equestrian Center. Trusty steeds will greet you at the beach&apos;s entrance for an unforgettable trek along the sandy coastline. Lunch is served at Point Pinos Grill located at the Pacific Grove Golf Links. Soak in views of this stunning course while dining on local seafood and fresh produce. See Monterey Bay from a different perspective this afternoon. Set sail with Monterey Bay Sailing for a one hour sailing adventure out on the Pacific Ocean. Let the natural winds from the bay power your journey on the open sea. Reminisce on your fast-paced vacay over dinner at Jacks Restaurant inside the Portola Hotel & Spa. Their sustainable seafood and extensive wine list is sure to have you leaving on a high note. Scenic Monterey County is one of the richest ecological regions along California&apos;s central coast, as proven by the diverse species that call it home. Whether you take your joy in spotting the creatures of land, air or sea, there&apos;s plenty of wild to experience here. What&apos;s wilder than having an elephant personally deliver breakfast to your room? The kids are bound to go ape-crazy once you pull up to your digs at the Vision Quest Ranch in the Salinas Valley. The Ranch, also home to the Monterey Zoo, is home to trained exotic and domestic birds and animals once use for film, television and live productions. You will feel like you are on a safari once you check-in to your African style bungalows equipped with running water, electricity and a private bathroom. Don&apos;t be surprised if you hear lions and tigers roaring just outside of your canvas walled suite. Enough land animals, now it&apos;s time to get up close and personal to some sea creatures. Just 20 minutes away from your bungalow is the world-renowned Monterey Bay Aquarium on Cannery Row. Discover the new Tentacles exhibit and get a behind-the-scenes pass where you will have access to "staff only" areas. Time to refuel! Just down Cannery Row is the C Restaurant + Bar at the InterContinental The Clement Monterey. Dine on fresh sustainable seafood or opt for kid friendly choices like Mac &apos;n&apos; Cheese and the Bistro Burger. Take your time to enjoy the massive views of Monterey Bay outside its windows and be on the lookout for a playful otter (or two) down below. Test your sense of direction at the Monterey Mirror Maze just across the street. The psychedelic setting is complete with high-tech lighting and fist-pumping music. Once you find your way out take time to stroll around the shops and attractions along Cannery Row. You can even take the Recreation Trail down to Old Fisherman&apos;s Wharf for a cup of good old clam chowder. Now that you&apos;ve seen animals from land and sea it&apos;s time to scope out some tiny black and orange beauties from the air. There&apos;s a reason Pacific Grove has been deemed Butterfly Town, USA as thousands of Monarch butterflies flock to the eucalyptus trees in this town, particularly at the Monarch Grove Sanctuary. These long-term "tourists" are best seen during wintering months, October through February.